Situated as the geographical and cultural divide between West and East, St Petersburg is a city that is a marvel of architecture, custom and art. Many great Russian artists and writers found their voice in this city that was commissioned by Peter the Great to resemble his favourite Western European cities. Built with long tree lined boulevards, narrow canals and grand public squares this is a city that visitors will thoroughly enjoy for finding wonderful architectural and cultural sites to visit. This blog will discuss a few of these sites and give ideas for different things that one can do in St Petersburg. One of the pre-eminent attractions of St Petersburg is the Winter Palace, which since 1852 has been opened to the public also as an art gallery. Previously the home of the Czars for more than 200 years the winter palace is comprised of six buildings that are now filled with works of art from the Western masters. 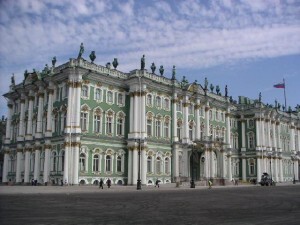 Drawing in more than 2 million visitors each year the Hermitage Museum is one of the largest in the world. Virtually wall papering the walls are the works of Picasso, Di Vinci and Van Gogh to name but a few. People suggest that you budget a good amount of time to wander this museum and soak in its collection. It has been said that if visitors spent one minute at each item in the museum it would take several years to fully visit the museum. A one day ticket costs around $18 US dollars while a two day ticket costs $26 US dollars. The museum is open from 10:30 am until 6 PM every day except for Monday. The Church of the Savior on Spilled Blood is one of the St Petersburg attractions that regularly brings legions of travelers to it. One of the world’s most intriguing churches along with Gotti’s La Sagrada Familia in Barcelona the Church of the Savior on Spilled Blood was commissioned in 1883 by Alexander the III. The theme of martyerdom and blood shed that the church is named after comes from its original intention of standing as a tribute to Alexander’s murdered father Alexander II. Visitors marvel at the church’s outside facades as well as the interiors massive wall mosaics.The Church of the Savior on Spilled Blood is open from 11 a.m. until 7 p.m from Thursday until Tuesday and costs around $10 US dollars to visit.